I checked your capx file. Go to event sheet 2 and then delete "Load Save Game from Slot..."
The Save Game function has nothing to do with localstorage. Do you have faced the same issue? Actually yes. Same happens to me if I use the Firefox browser for testing. It seems like the LocalStorage works on the first read/write, but then it tooks very long to get the data. > Do you have faced the same issue? it's working now ! seem that like so it's working, I do not have any delay no longer anymore and when I restart the layout the localstore works as expeted even I you leave the game instantly ! I have opened a bug report, because the LocalStorage still crash when I'm using Chrome. All other browsers are working fine. Here is the link to the topic. can you please recheck your link. It seems to be cutted. I checked your file and you and you made following mistake. 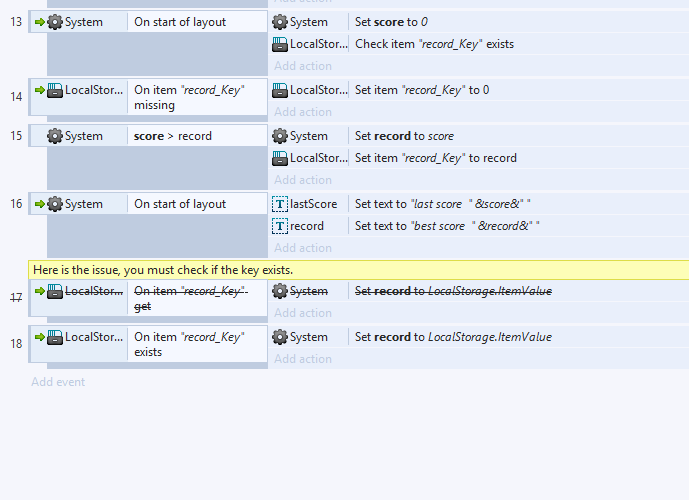 On the start of layout you check if the key exists. That's fine. But you must setup a condition then "If key xxxxxx exists" and not "on item xxxxx get". So just make the changes shown on the screen shot above and your save/load function should work. I seem to have a problem. I have a fairly simple localStorage high score function that works fun when I run the layout from C2, but when I exported it and uploaded it to chromestore and scirra arcade, it just returns 0, any ideas on how i could fix this? thanks.